Picnics are super fun, but not always convenient if you're faced with bad weather or find yourself far from a green space. 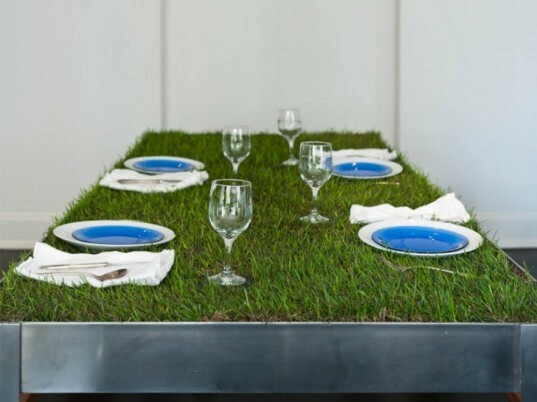 To turn every meal into a picnic (sans the army of invading ants), Haiko Cornelissen Architekten designed this sod-covered aluminum table to bring the outdoorsy experience right into your city apartment. And don't worry about spilling your water during occasions of fine-dining -- it'll help the grass grow! The farm-to-table is made from aluminum with sturdy square legs and a tray-like table top. Stones sit at the bottom, which is topped with soil and finally a layer of sod. Watering the sod is done by hand and drains down into the stones. Sunlight, irrigation and interior climatic conditions all determine the status of your table. Unfortunately, no table-sized lawn mower exists, so cutting of the grass is all done by hand with scissors. The table could also be reasonably planted with herbs, flowers, wheat grass or even sedum for a low maintenance experience. Nature is an elegant backdrop and table decorations suddenly become passe. The farm-to-table table is made from aluminum with sturdy square legs and a tray-like table top. Stones sit at the bottom, which is topped with soil and finally a layer of sod. Watering the sod is done by hand and drains down into the stones. Sunlight, irrigation and interior climatic conditions all determine the status of your table. Unfortunately, no table-sized lawn mower exists, so cutting of the grass is all done by hand with scissors. 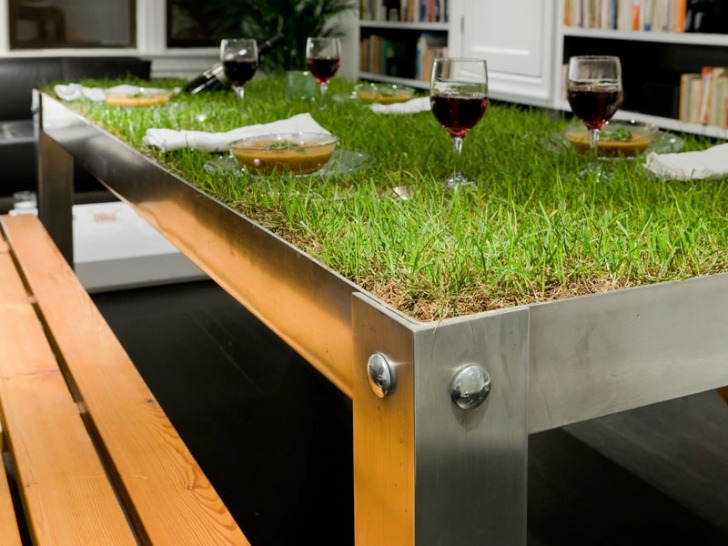 The table could also be reasonably planted with herbs, flowers, wheat grass or even sedum for a low maintenance experience. Haiko Cornelissen's table is a commentary on the quickly growing urban farming trend. The table brings the rural experience of picnicking into the city and into your own private apartment.